A short lookbook film featuring our Royal Lace cuff, Matador cuff and Modern Widow cuff from our Vintage collection and Blue Moon cuff from our Embellished collection. 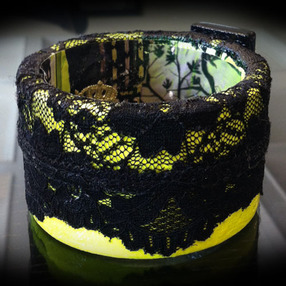 This cuff is part of our Vintage collection. 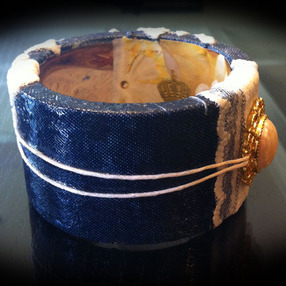 Handmade, one-of-a-kind wooden cuff. 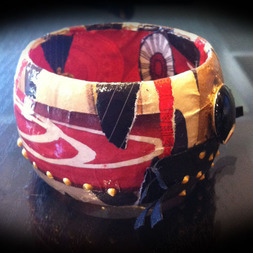 Made from all recycled and repurposed material. 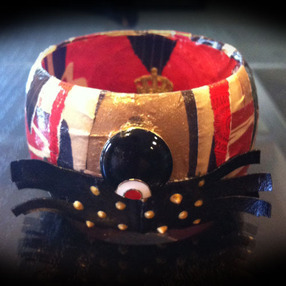 This particular cuff is made out of paper, black pleather, painted gold dots, vintage brooch. Dome exterior bangle, approximate inner diameter 2 1/2" (Medium), width 1 3/4". All our bracelets have been coated in a sealer for shine and to make it water resistant. However, they are made with paper so we wouldn't suggest showering or swimming with them on. This cuff is part of our Vintage collection. Handmade, one-of-a-kind wooden cuff. 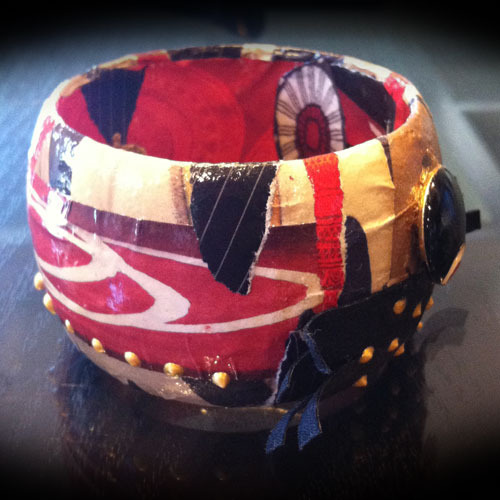 Made from all recycled and repurposed material. 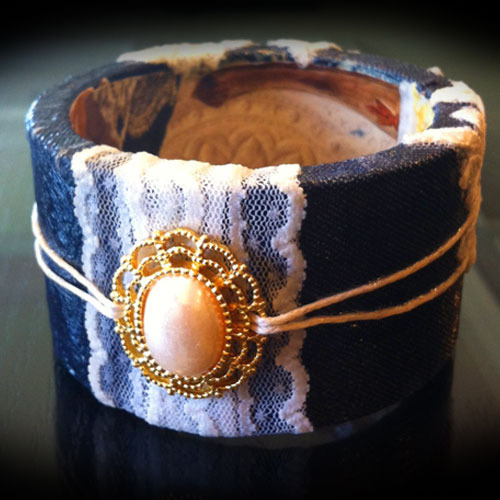 This particular cuff is made out of paper, recycled denim and lace, vintage gold plated pearl earring and small gold plated bow earring. Flat exterior bangle, approximate inner diameter 2 5/8" (Medium), width 1 3/4". 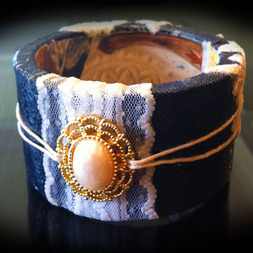 This cuff is part of our Vintage collection. Handmade, one-of-a-kind wooden cuff. Made from all recycled and repurposed material. 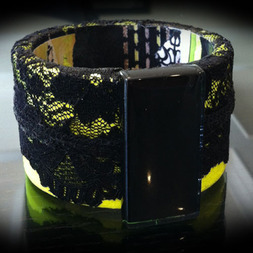 This particular cuff is made out of paper, bright yellow neon acrylic, vintage black lace, black glass stone. Flat exterior bangle, approximate inner diameter 2 1/2" (Small), width 1 3/4". 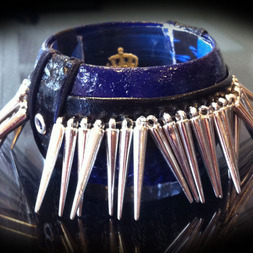 This cuff is part of our Embellished collection. Handmade, one-of-a-kind wooden cuff. Made from all recycled and repurposed material. 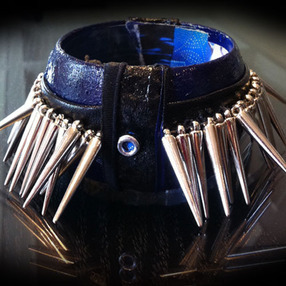 This particular cuff is made out of paper, black pleather, silver eyelets, silver plated acrylic spike charms, hand painted in blue acrylic paint and paper texture. Dome exterior bangle, approximate inner diameter 2 1/2" (Medium), width 1 3/4". Your overall satisfaction with your purchase is very important to me. You have 3 days after receipt of your purchase to contact me with the return request (so please open your package right away)! Please note that all shipping charges are the responsibility of the customer and are not refundable and merchandise will only be accepted that is in it's unused, original condition. As a buyer I know I want to receive my purchases as quickly as possible.- this is why I ship all my items USPS Priority Mail (2-3 day in-transit shipping time - domestic US). Your purchase will be shipped as soon as possible after payment has cleared. 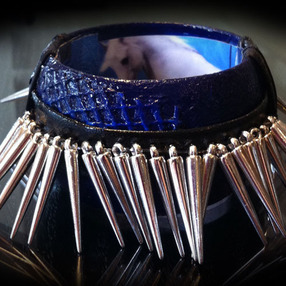 If you purchase more than one cuff let me know and I will combine shipping. I am not responsible for lost or damage packages. If you would like to upgrade to faster shipping (Express, Over-night), add insurance, etc., please contact me and I will send you an invoice for the difference in cost.